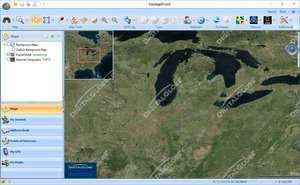 VantagePoint software is a unique application that allows you to manage your Magellan outdoor GPS experience. With the click of your mouse, you can view and search Satellite Imagery, Summit Series, City Series, and other Magellan maps. Create your own GPS journal complete with geotagged pictures, voice memos, and videos. Upload your tracks, waypoints, and multimedia files from your compatible eXplorist GPS receiver. Version 7.0.15824 is a freeware program which does not have restrictions and it's free so it doesn't cost anything. For security reasons, you should also check out the VantagePoint download at LO4D.com which includes virus and malware tests. Additional screenshots of this application download may be available, too.